The vets crew made the 580 mile round trip to Deal in Kent for the South Coast Championships on Saturday 14 September. They raced there after winning the West of England veteran championship at Bideford Regatta previously that month. They were up against the champions and runners up from Hants and Dorset and the Coast associations to see who would become the champions of the South Coast. The crew rowed in coast boats which are shorter and much wider for the conditions the English Channel can present. The Blues came fifth in the final after lying fourth, they were a length behind second and third place up to 1500m mark when a couple of large waves stopped them dead in the water and nearly sank them. After this it was just a case of making it to the finish line without sinking . The conditions continued to deteriorate further with only three more races taking place before the event was called off. 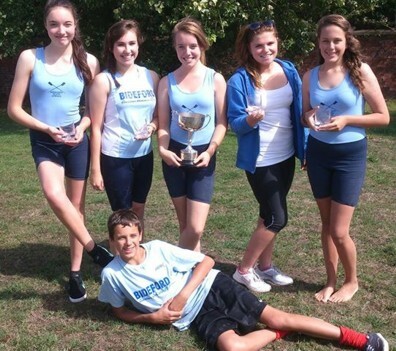 Bideford regatta was the last regatta of the West of England 2013 season on Saturday 31 August. It turned out to be a good day for Milo George with him reaching four finals and taking three first places, he made his debut in the men’s novice sculls the first time he has sculled on his own this season and winning easily. Next he joined Owen Godwin to win their heat and take first place in the men’s novice double final. His last win came in the last race of the regatta with Megan Harty, Hannah Myers and Owen in the mixed senior four. There was disappointment for the ladies junior 16 quad claiming a third place, which give the Reds the championship which they took by winning the race. Silverware came to the ladies novice double of Annie Cook and Jessica Myers dominating the race from start to finish. There was a fifth place in the men’s junior 16 sculls for Declan Monaghan, in the ladies junior 14 double there was a fourth place for Ellie Walker and Amy Cornish in their first season. The girls were then joined by Jessica Webber and Mya Bosher to claim a fourth in the junior 14 quad. The rowers also picked up a fifth in the ladies novice four, a fourth in the men’s senior c four, and a fourth went to the mixed novice four. Back winning were the ladies novice coxed quad of Hannah and Jessica Myers, Annie Cook, Zoe Robertson leading from the start line to the finish comfortably. Last to pick up a cup for the club was the men’s master coxed four of Nigel Cann, Steve Clements, Colin, Neil and cox Chloe Pennington. They pulled out a three quarters of length lead by the mid point only for the Reds to push hard at the Blues all the way up the quay to reduce their lead, but the Blues held on to win by two feet in a cracking race in front of the crowd lining the quay. Thursday saw Bideford Blues descend on a warm sunny River Dart for the Poet of Dartmouth Royal Regatta, races started at nine third in the morning running until nearly six o’clock with the last race being the men’s open eights. The Blues were up against opposition from the normal West of England clubs but also clubs from West Sussex, Hampshire, Berkshire, Oxfordshire and a first for Dartmouth Regatta two clubs from Australia being Cario Bay and Melbourne Rowing clubs. The day started with a disappointment in the ladies junior 16 quad with the crew of Shannon Monaghan, Charlottie Berry, Kirsty Snow, Abie Lawson and cox Tina Robertson placing second and losing out to championship rivals the Reds, this means it is all to row for at Bideford Regatta on Saturday to reverse the positions and decide the champions. Winners on the day were the ladies novice double of Annie Cooke and Jessica Myers taking their final by five lengths from Plymouth. Also picking up silverware the mixed senior c four of Megan and Jack Harty, Oli Roberts-Key, Zoe Robertson and mum Tina coxing winning from Shoreham and Plymouth in the final. The club also picked up minor places in finals on the day after progressing through had heats , but there were disappointments with crews getting knocked out in their heats . The club are next racing on Saturday 31 August at the final West of England Regatta at Bideford, first race starts at 12:45. Saturday 24 August was Torquay Regatta at Hollicombe beach half way between Torquay and Paignton. The conditions were very sunny but with a strong offshore wind blowing, this made the start area difficult for lining up in the early races. Not long into the programme of races the umpires shortened the course to 800m to take advantage of the shelter of cliffs at Livermead point. The Blues had a small squad completing with the ladies junior 16 quad of Shannon Monaghan, Charlottie Berry, Kirsty Snow, Abie Lawson and cox Colin Pennington racing first. They lined up with current championship leaders Bideford Reds and Plymouth, the Blues made a great start pulling out to half a length in the first 100m. They continued to row away from the Reds over the course and finished three lengths up on them. This has now put the two Bideford crews joint top of the championship with two regattas remaining. The girls had a quick turn around to next race in the ladies junior 16 doubles with Abie joining Shelby May and Kirsty and Charlotte doubling together, with the latter finishing 2nd and the other girls coming fifth. Next was the mens masters coxed four of Colin and Neil Pennington, Nigel Cann , Nick Cleasby from the Torquay rowing club and Chloe Pennington as cox , they were racing against Teign Scullers from Teignmouth. The Blues won quite comfortably with a easily verdict. Last out for the club was Declan Monaghan in the men’s junior 16 sculls, with conditions now very choppy he managed a creditable 4th in a field of six. Next is Dartmouth Regatta on Thursday 29 August. Appledore Regatta started in some of the best conditions for many years in almost flat tide with no wash. The Blues women’s junior 18 double of Annie Cook and Jessica Myers picked up the first silverware for the club taking the race from the B crew. Race of the day for the club was the women’s Junior 16 quad of Shannon Monaghan, Charlotte Berry, Kirsty Snow and Abbie Lawson with cox Zoe Robertson. The crews racied neck and neck all the way down the course with the championship leaders from the reds and just lost to them by a canvas at the finish but the reds were judged to have taken the Blues’ water and hit them so they were disqualified. The club also had seconds in the novice men’s double , mixed open fours, women’s novice quad and thirds in women’s junior 14 quad, men’s senior c four, and men’s junior 16 sculls and women’s novice quad. Blues crews made a great start to Paignton Regatta on Saturday, having a 9:30 start so as to miss the wash off of the many pleasure boats that use the area where the course is rowed. It was the women’s junior 16 quad of Shelby May, Charlotte Berry, Kirsy Snow and Abie Lawson claiming their first victory of the season with a win over home town rivals the Reds. Keeping the club in winning ways on the day were the mixed senior b four of Hannah Myers, Alice Jackson , Milo George and Owen Winter who dominated their race winning from a strong Dartmouth four. Also picking up silver ware were the women’s novice quad of Tina Robertson , Annie Cook, Hannah and Jessica Myers in a three boat final against Dart Totnes and the Reds. With conditions now getting choppy it was down to the the mixed junior 18 quad to secure the clubs last victory on the day with Zoe Robertson, Charlie White, Declan Monaghan and Kirsty Snow coming home ahead of Paignton to take this final. There were second places for the men’s novice double scull and the mixed novice double scull , the club picked up more minor places on the day in single and double sculls. 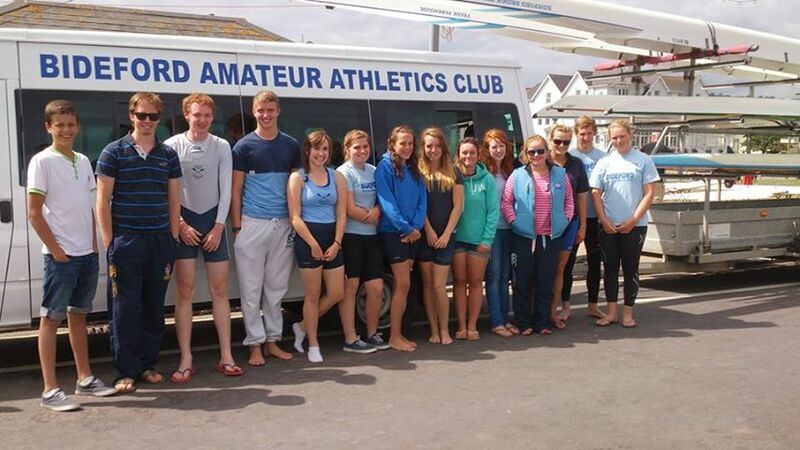 The club are next competing at Appledore and Instow Regatta on Sunday 18th August. Bideford Blues rowing section were competing at Exeter Regatta on Saturday 13th July over the 400 m sprint course on the river Exe. Conditions were great on the day except for the temperatures in the late twenty degrees and touching thirty degrees. The racing started at 10:30 with races every 3 minutes until the last race at 18:30. The winner on the day was Annie Cook in the ladies novice scull keeping up her good form of late. Charlie White and Milo George were looking to win the men’s novice double scull lying in joint first place with Totnes when, just as they were about to hit the finish line, Milo clipped the dock side with his scull turning the boat over, leading to the pair being placed second by the line judge. There were second places for Hannah and Jessica Myers, Annie Cook and Zoe Robertson in the ladies novice quad losing to Dartmouth by a canvas. Also placed second were the ladies’ junior 16 quad of Shannon Monaghan, Charlotte Berry, Kirsty Snow and Abbie Lawson losing to the Reds by half a length. Annie and Jessica then teamed up together to place second in the women’s novice double sculls, Zoe and Hannah sat in with Mio and Oli Roberts-Key to came second in the mixed senior c four. Charlotte and Kirsty also picked up second in the ladies junior 16 double sculls. The men’s master D four of Steve Clements, Nigel Cann, Colin Neil and Chloe Pennington won their age final by a length and half from Totnes and Exeter which then placed them in the masters row-off final against Bideford Reds and Teign scullers who were competing at masters E an age category above them. This meant they had to give a 3 seconds start to them and then try and catch them up. The Blues got off to a clean start catching Teign scullers and passing them only to lose to the Reds by a canvas on the finish line. All the other crews on the day were knocked out in their heats. Saturday 29th June saw the Blues head to Wimbleball Lake, high up on Exmoor. Competing for the Club was a strong junior and novice squad. First out was the mixed novice four of Oli Roberts-Key, Owen Godwin, Sophia Craddock and Freyja Heddinson with cox Zoe Robertson, placing second behind Castledore. Junior 16 sculler Charlie White was next out also picking up a second place behind a sculler from Exeter. Oli and Owen then teamed up with Jack Harty and Milo George, both home from university, to row in the men’s novice four and they also picked up a second place. The ladies’ novice quad of Zoe Robertson, Annie Cook, Hannah and Jessica Myers also placed second for their efforts. Annie and Jessica then went out in the novice double but also missed out on a victory, gaining second. The newly formed men’s junior 16 quad of Charlie White, Declan Monaghan, A Batley and J Ireland with cox Tina Robertson raced to a third place in their maiden outing. Also placing second was the ladies’ junior 16 quad of Shannon Monaghan, Charlotte Berry, Kirsty Snow and Abbie Lawson, Jo Moulder in the ladies junior 16 scull and Megan Harty, Hannah Myers, Jack Harty and Milo George in the mixed senior c four. The men’s novice double of Owen and Charlie were placed second but not before having to re-row after racing all the way down the course neck-and-neck with Dart Totnes for the lead only to be washed out by a returning umpires boat just off the finish line which stopped the race. The crews went back to the start line to race again but this time the Blues lost out by one foot.